A city’s streets can tell a lot about that city and its residents: who we are, where we came from, and who and what we value. In other words, names are a huge part of understanding our heritage. At least, that’s what I’ve discovered when looking at Toronto’s roads. In general, Toronto streets fall into one of three themes: (1) throwbacks to our British roots; (2) our city and community builders, and (3) literal descriptions (usually of the surrounding environment). If we really wanted to, we could also include a fourth category of streets that do not really have a rhyme or reason that we can tell, or their story has simply been lost. First, some streets don their names after British royalty. Victoria Street and Queen Street are after Queen Victoria. The ‘King’ in King Street is King George (who might potentially also lend his name to George Street). Prince Frederick, Duke of York and Albany is honoured by, you guessed, Frederick and York Streets. These streets are the historical bigwigs across the pond. In the second case, we have places like John and Simcoe Streets named after the city’s founder John Graves Simcoe, Cummer Avenue after Joseph Kummer of Willowdale, Leslie Street after arborist George Leslie of Leslieville, Bloor Street after brewer Joseph Bloore of Yorkville (and a seriously scary looking fellow), Denison Avenue after the George Denison the original owner of the land now known as Kensington Market (many other streets in area are named after his family as well), and Jarvis Street after the Jarvis family. Austin Terrace is named after the Austin Family who built and resided in the manor known today as Spadina House and Gardens Museum. 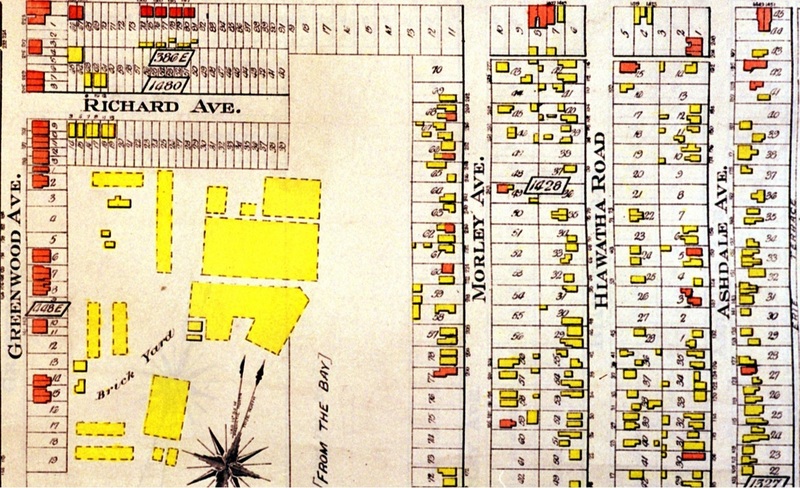 At even a more local level, in early maps of Leslieville, we find streets that have now been redubbed, like Morley Avenue (now Woodfield), after men who were active in the community’s clay industry. We don’t need to look any further than Old Toronto to see the last category play out. We find streets like The Esplanade. Sometimes near water, the esplanade (basically meaning road or waterway) nickname makes sense because at the time of its founding, the waterfront wasn’t as far out. Speaking of, Front Street was originally named because it followed the original coastline of Lake Ontario. Church Street one time housed many churches (leading to the Toronto ‘the Good’ moniker for the city) and at the foot of Parliament Street was Ontario’s first government buildings. River Street alludes to the adjacent Don River. Don Mills Road, which was once what we know today as Broadview Avenue (titled for the ‘broad view’ one sees of the city when passing over Riverdale Park East), refers to the early industrial mills situated on the Don River. Lot Street, a street we know today as Queen, referred to the parcels or ‘lots’ of land that ran to Bloor Street. Finally, Spruce, Elm, Oak are the names of roadways in the downtown area alone – presumably titled after the trees that lined them. So what does this all say about us? Our ancestors loved to pay tribute to the regime that founded the city as well as the Canadians that started the communities within the city’s confines…and that sometimes an unoriginal descriptor is perhaps the best name. This is all rightfully so. We should pay homage to our community founders and as much I support dumping the monarchy, they were instrumental in our history. And yes, it is fun and easy to be literalist. In Athens, I stayed on a street called 28 October Avenue – a date in which the Greek government said OXI in refusal to the Mussolini Fascists in 1940. Other cities employ the dates of revolutions from dictatorial or colonial rule (in the case of Latin countries, both). In other words, dates that resonate in the national and local consciousness of people. Do we have that in Canada and Toronto? The 1st of July would be the most obvious choice. If anything most Canadians identify most with at least that day. I’d throw out a couple of other possibilities of a more local affiliation: 6 March Avenue and 27 April Street. The former reflects the day in 1834 when the Town of York was incorporated as the City of Toronto while the latter is in reference to the Battle of York in 1813 which marks the little known (and only) occasion when The Town of York was occupied by opposing American military forces. Would these work in Toronto? Likely not. Although I sense that there is a growing connection between the population and its history, I somehow doubt most people could list off Toronto’s birthday or that a battle once took place on its land. Plus, not to discount their places in this city’s story, they do not have the “draw” that a revolution does. But it would be interesting to have anyways. The other notable omissions are cultural icons within our streets. I can think of three: Mike Myers Drive in the Kennedy and Lawrence area, named after the famed Scarborough-born actor and comedian; Ed Mirvish Way, located beside the Royal Alexandra Theatre, is an homage to the great performing arts promoter; and the Martin Goodman Trail after the Toronto Star Editor-in-Chief. While the last of these is not a motor vehicle way, it is still a method people get around in the city and thus I have included it. I’d like to see more though. How about a Michael Snow Way? A Neil Young Boulevard? An E.J. Lennox Street? All three have made grand contributions to Toronto’s visual arts scene, music scene, and streetscapes respectively. Lastly, I wonder about homages to the Aboriginal presence in the Toronto area. Yonge Street and Davenport Road were both originally Native trails, although their names do little to alert of that (although there is plenty of work done that tell those stories). Spadina comes from ishpadinaa meaning “be a high hill or sudden rise in the land” in Ojibwe. The High Park neighbourhood features several ‘Aboriginal’ and non-PC-named streets including Indian Trail, Indian Road Crescent, and Indian Road. The latter intersects with Algonquin Avenue, one of the Native groups of Ontario. In the Weston Road and Rogers Road area one can find Seneca and Cayuga Avenues. These are of course two tribes of the Iroquois Confederacy. 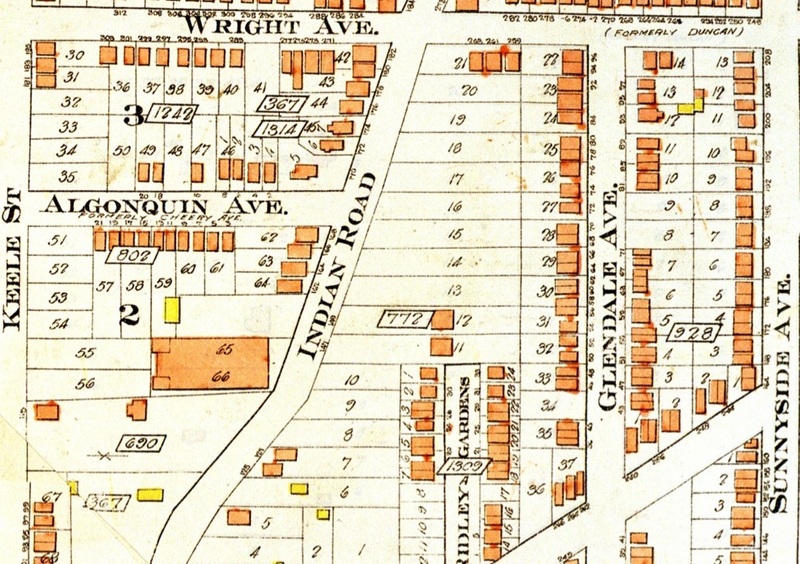 The Iroquois connections continue with Hiawatha Road in Leslieville, as Hiawatha is the legendary leader who united the groups. I quite honestly expected a lot less representation than I discovered. This is of course only a start, however. Aside from Spadina, which is actually situated on a hill near Casa Loma, their situations within the city are questionable. Do the ‘Indian’ streets follow a historical Aboriginal trial? Cayuga, Seneca, and Hiawatha are all in historical working class, industrial areas, ironically near brick yards. I wonder if there were any reason for the selection of those names in those areas. How do we name streets anyways? 4. to recognize native wildlife, flora, fauna or natural features related to the community and the City of Toronto. In other words, these are the same categories I have identified through my own observations while examining maps of the city. A proposal can be put forth by a councillor or members of the community at large. These proposals eventually reach a Community Council (consisting of the four former municipalities of Metro Toronto; Toronto and East York consisting of one). They might also reach City Council at large for a final say. There are several things to note in terms of the points I raised already. First, the policy goes on to say in redubbed streets, names of living persons should be avoided. This makes my Neil Young suggestion perhaps a bit difficult, even though a commemoration of Mike Myers seemed to get through. Second, there is no explicit mention of the use of dates, but looking at section 6.1.2 (b), the argument could be made. Again, I do not think there will ever be a 6 March Boulevard. The connection to the city’s heritage does not seem to exist in that form.